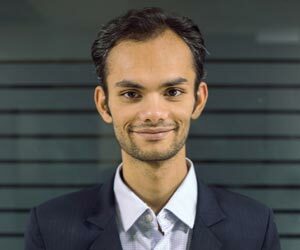 Saurav Kumar is the cofounderand CEO of Cube26, an India based technology innovation firm focused on revolutionizing the user experience across multiple devices and platforms.He pursued his undergraduate in Computer Science from Delhi College of Engineering, Delhi University. After that he joined INRIA, France, where he worked on the next generation of Driving Assistance Systems to mitigate roadside accidents. Later, he joined Cornell University’s Master’s program in Computer Science focusing on Machine Learning, Computer Vision and Natural Language Processing. During his Cornell days he worked on building a machine learning and computer vision system for Autonomous Underwater Vehicles, which went on to win the 2nd Prize at the 14th International RoboSub Competition, 2011 conducted by the AUVSI and Office of Naval Research, U.S.A. After completing his Masters, he headed the Research and Development team at MOAT, an ad Startup in New York where his main focus was around using vision and machine learning techniques to understand brand engagement. He has also worked on building Global Search Middleware component of Yahoo! Search. At Cube26, he is working with Consumer Electronics Companies, Ad Networks, Mobile ecosystem brands to incorporate Cube26's innovations. Key note speaker: AamerAzeemi, Smart Cities Advisor, Independent Director, Bhubaneshwar Smart City Ltd.